« What is a tronie? This is one of the monotypes I printed last month, February 22 and 25, at The Button Factory Artists’ Studios. At the end of my printing sessions last month, Darlene Furbush Ouellett and I both felt we work well together in her studio, so we made an agreement for me to print in her studio two days each month. I printed yesterday, March 22, and will print on Monday, March 25. Darlene paints in the main room of her studio near the two tall corner windows, one facing north and the other facing east. 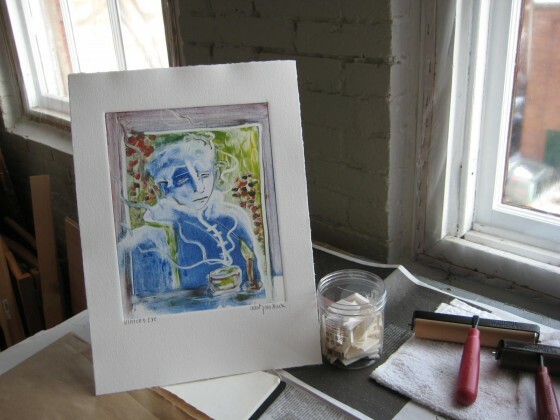 I print in Darlene’s printmaking room which houses her etching press, drying racks, a work table which faces a tall north window, high stool and good lighting. There is a doorway to and from the main room and walls which reach part way up to the studio ceiling. Darlene and I both enjoy listening to music while we work and, happily, we like the same kinds of music. Printing in February was a bit stressful and awkward at first. After all, I hadn’t printed in nearly two years and was doing so in someone else’s studio on someone else’s press. Yesterday I felt totally at ease and in the zone. Before printing, I looked at the monotypes I printed a month ago, decided two of them were finished and titled these pieces. One of my new monotypes, Winter’s Eve, is shown above.